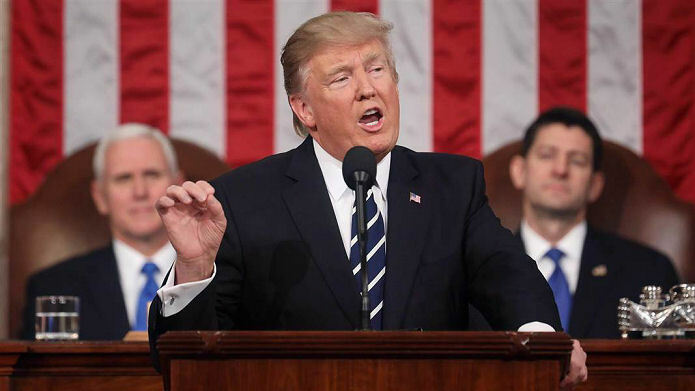 President Donald Trump delivered his best speech yet to the joint session of Congress Tuesday night. He addressed familiar promises from his campaign and calling for unity to address issues that he says are plaguing the country. America’s President Donald J Trump, addressed his first speech to joint congress last night. Trump’s call for an end to division and trivial fighting comes in the wake of a bruising campaign and a tumultuous start to his presidency. The speech also comes amid a storm of questions about alleged contacts between Trump associates and suspected Russian officials, which the president has described as fake news. The time for small thinking is over, he said. The time for petty trivial fights is behind us. We just need the courage to share the dreams that fill our hearts. The bravery to express the hopes that stir our souls. And the confidence to turn those hopes and those dreams into action. Trump began the address by condemning the recent threats against Jewish centers and a suspected hate crime in Kansas. The president had drawn fire for not immediately addressing the Jewish Community Center incidents and not making public comments about the fatal Kansas shooting until tonight’s speech. Recent threats targeting Jewish community centers and vandalism of Jewish cemeteries remind us that while we may be a nation divided on policies, we are a country that stands united in condemning hate and evil in all of its very ugly forms, Trump said.